The Aircraft Engineering Principles and Practice Series provides students, apprentices and practicing aerospace professionals with the definitive resources to take forward their aircraft engineering maintenance studies and career. 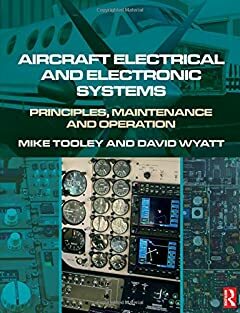 This book provides a detailed introduction to the principles of aircraft electrical and electronic systems. It delivers the essential principles and knowledge required by certifying mechanics, technicians and engineers engaged in engineering maintenance on commercial aircraft and in general aviation. It is well suited for anyone pursuing a career in aircraft maintenance engineering or a related aerospace engineering discipline, and in particular those studying for licensed aircraft maintenance engineer status. The book systematically covers the avionic content of EASA Part-66 modules 11 and 13 syllabus, and is ideal for anyone studying as part of an EASA and FAR-147 approved course in aerospace engineering. All the necessary mathematical, electrical and electronic principles are explained clearly and in-depth, meeting the requirements of EASA Part-66 modules, City and Guilds Aerospace Engineering modules, BTEC National Units, elements of BTEC Higher National Units, and a Foundation Degree in aircraft maintenance engineering or a related discipline. تقدیم به دوست عزیزم: مهندس میثم ارمغان.